On Saturday, December 14, the Connecticut Society will join the Maine State Society and thousands of other volunteers for the third year in a row for a wreath-laying ceremony at Arlington Cemetery to honor the men and women of Connecticut and the nation who have served in the military. Connecticut Society volunteers will meet at 9:15 am at the main entrance to the Cemetery - look for the group with the Connecticut flag. CT Society volunteers who want to head over as a group from the District should meet at 9:00 a.m. at the International Square Starbucks (1825 Eye Street, at the top of the escalator at the 18th Street exit of Farragut West Metro Station). There will be a short welcome and briefing of all volunteers at 9:30 am at the Memorial Amphitheater near the Tomb of the Unknowns. There will be signs directing you to the location. We will start placing wreaths at approximately 10:00 a.m. There will be special wreath ceremonies at the President Kennedy's family memorial at 11:00 am, at the Mast of the Battleship USS Maine at 11:30 am, and a final special wreath ceremony at the Tomb of the Unknowns at 12 Noon. 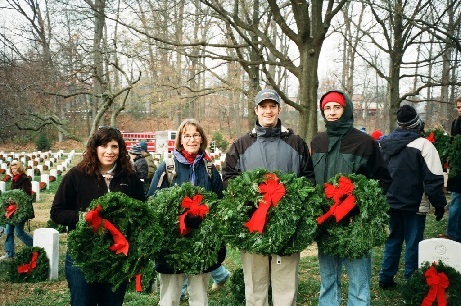 Morrill Worcester, owner of Worcester Wreath Company, Harrington, Maine, will again donate thousands of Maine balsam fir holiday wreaths to be placed on graves at Arlington National Cemetery. If you have any questions, please contact Mike McKiernan at mckiernanm@gmail.com or 860-729-6368.